TACLOBAN CITY- A police officer shot and killed a motorcycle mechanic in a public market in La Paz, Leyte at about 10:40 am Sunday(June 3) with a personal grudge that happened 14 years ago as the alleged motive. Senior Inspector Ernie Rocha, officer-on-case of the La Paz police station, identified the perpetrator as SPO1 Ritchie Ramelo,38, who is assigned at the PNP-4 based in Camp Vicente Lim, Calamba, Laguna and a resident of Barangay Miring, Tabon-Tabon,Leyte, who shot several times Adan Tejero,37 using his service firearm of Caliber 45. 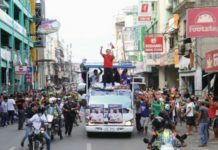 Based on their investigation, the shooting incident happened at about 10:40 in the morning Sunday (June 3) at the town’s public market located in Brgy. Poblacion, district 3. Rocha said that the victim was playing chess outside a store, El Cinco General Merchandise, when the suspect walked his way towards him and shot him three times, hitting him on different parts of his body. The police officer immediately ran to a waiting motorcycle driven by his cousin identified as Ricardo Gausin, 33 and fled. 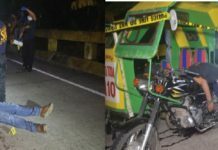 Rocha said that upon learning from witnesses where the suspect and his companion was heading, they immediately conducted their pursuit operation which led to their arrest in Brgy.Cabacungan, Dulag, and Leyte. The suspects were arrested at about 11 am. “We asked him to stop but he attempted to draw his service firearm. But I asked him not to attempt as this could led to a bloody confrontation. He throw his gun and surrendered to us,” Rocha said in a phone interview. And based on their questioning with SPO1 Ramelo, he allegedly shot the victim due to a personal grudge. “He had a grudge against the victim as he claimed that he was bullied and physically abused 14 years ago by the victim. All these years, he kept his anger towards the victim,” Rocha said. Ramelo, who went home to his village in Miring to attend its fiesta Saturday, and his cousin are now detained at the La Paz lockup cell as they are to be charged for murder.